When it comes to advertising and media, yesterday's marketing pros had it easy. Media was cheap or free to consumers, who viewed ads in exchange for entertainment. Three networks dominated television and almost everyone watched the same shows and news broadcasts. Advertising decisions were relatively simple and clear-cut: The message was in the hands of the advertiser. Fast-forward to the new millennium and a world barely recognizable to the "mad men" of old, where mass audiences have declined and the consumer now controls the content of media that did not exist until recently. Online video, mobile ads, branded entertainment, virtual worlds, blogs and social networking — all are among the latest technologies being used to reach customers in novel and powerful ways. Shining a light on this complex landscape is a new book edited by Bobby Calder, the Charles H. Kellstadt Professor of Marketing and director of the Kellogg School's Center for Cultural Marketing. 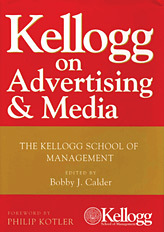 Kellogg on Advertising and Media features a series of essays on the top concerns facing today's marketing professionals, from integrated advertising to crisis management. The book offers the latest thinking about media and advertising by several Kellogg faculty members, including Alice Tybout, the Harold T. Martin Professor of Marketing, Angela Lee, the Mechthild Esser Nemmers Professor of Marketing, and Daniel Diermeier, the IBM Professor of Regulation and Competitive Practice. 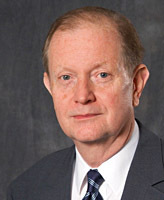 Kellogg alumni and executives associated with the school also feature prominently in the book. "There's been a sea change in the world of marketing," Calder says. "Marketers can now target ads to consumers and content environments, and they can enable consumers to interact with ads in specific content sites. There's tremendous potential for innovation, and it's a good time to take a look at what's being done." Running throughout the book is the theme of engagement. With increased competition, the need to create a deeper, more interactive experience for consumers has assumed a heightened urgency, and Calder argues that fostering that sense of engagement is the key to succeeding today. In the book's opening chapter, Calder and Medill School of Journalism Professor Edward Malthouse discuss how to create and measure media engagement. They provide a set of metrics that marketers can use to determine how deeply they are creating that sense of involvement between consumers and brands. Claudio Marcus '87, executive vice president of market development of Visible World, who explains the importance of customizing video for television and the Internet. Jim Newcomb '02, senior manager of brand management and advertising at The Boeing Co., who argues that marketing can play a greater role in the business-to-business arena through the use of intensive and immersive media. Scott Berg, director of worldwide media at Hewlett Packard, who discusses the opportunities and pitfalls of moving into new media. The book also features chapters contributed by Medill School of Journalism faculty, including Clarke L. Caywood; Julie Roehm, leader of change efforts at Ford, Wal-Mart and other companies; Charles Spinosa and David Le Brocquy of Vision Consulting; Michelle Roehm, an associate professor of marketing at the Babcock School of Management; Michael Schreiber '02, director of business development for NBC Universal's digital distribution division; Richard Kolsky, president of management consultancy Kolsky & Co.; and Jim Webster, a professor of communication studies at Northwestern University. All offer insights to new and experienced marketers alike. "Marketing is changing, and if you've been in the field for a while you need to adjust your thinking to the way the field is changing," Calder says. "And if you are new to marketing, you'll see there are tremendous opportunities to do innovative things."